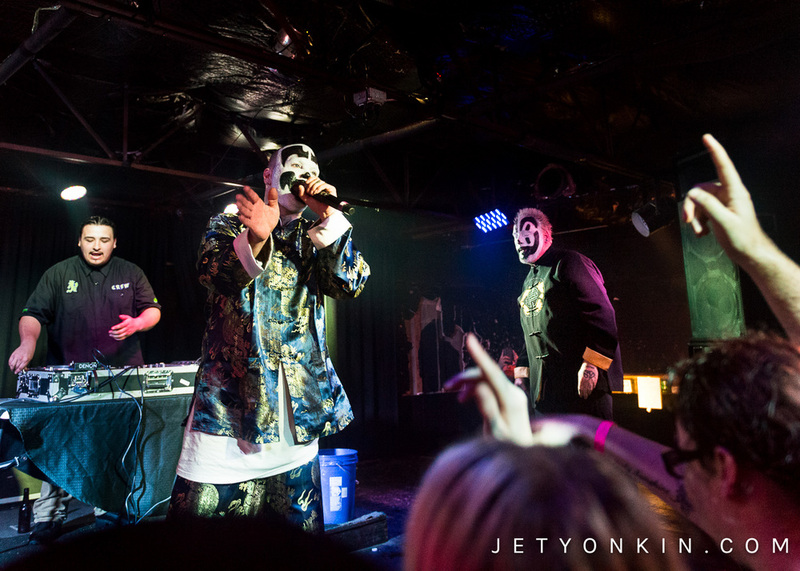 The Insane Clown Posse's Riddle Box Tour recently came through Dallas/Fort Worth with a concert performing 1995's The Riddle Box album, the Third Joker's Card, at The Rail Club followed immediately after by a special after party concert at Tomcats West. Here is a personal account of my experience photographing both shows for Faygoluvers Heaven. 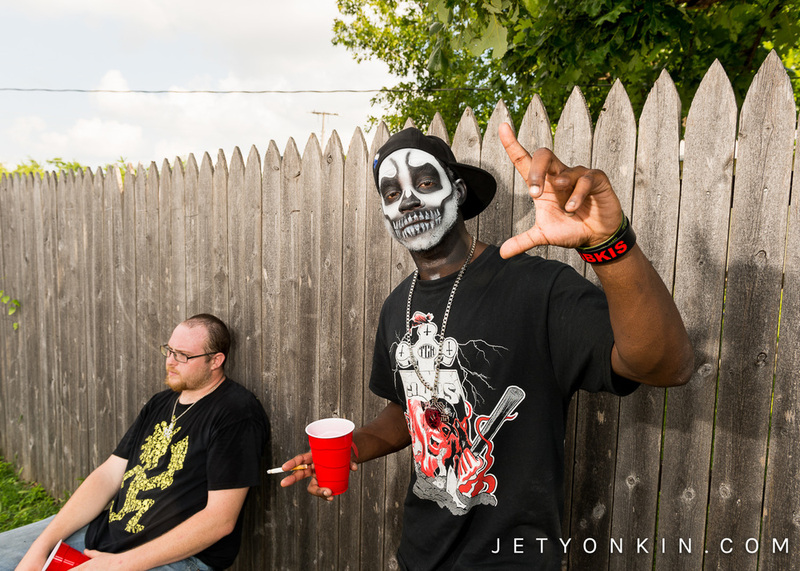 I arrived at The Rail Club in Fort Worth at three in the afternoon and the parking lot was already full of Juggalos cooking out, smoking, and tailgating outside of their cars, catching up with their extended Family of Juggalos. I walked around, talking with friends and photographing everyone as they socialized, prepared for the show, and ate grilled chicken, brats, and hot dogs being served up free for everyone. The entire afternoon was nothing but love from all of the Juggalos and Juggalettes as they eagerly anticipated a night of ICP like no other, the clowns were performing the Riddle Box album from 1995 in its entirety on the Riddle Box Tour show, then heading across the street to a tiny venue to perform at an after party just to show love to DFW for their part in Riddle Box history. Besides the love, everyone was also feeling the heat and some stayed in their air-conditioned cars during the worse of it to keep from sweating off their face paint. Everyone acted as if no one could see and no one cared, everyone was drinking and smoking, getting naked as they changed by their cars, chanted clown songs, and occasionally threw Faygo. Finally, it was time for Scottie D and me to enter the club for the show. The endless line had snaked its way into the venue and we entered under tough scrutiny from the security for our cameras and press passes, but upon entering were immediately forced into the massive crowd crammed in the medium-sized building. Razakiel had just left the stage and local act TX-Unity performed next, followed by a set from Axe Murder Boyz member and ICP’s recent henchman, Young Wicked. Once he finished, the tarp went up on stage obscuring the view as the crew set up for the clowns. The crowd’s excitement slowly rose to a fever pitch until the tarp fell revealing two Riddle Boxes on stage filled with Faygo and the face of the Riddle Box Dark Carnival character himself on the backdrop. The intro music of friends driving until getting into a deadly crash played and voices urged the recently deceased to turn the crank on the Riddle Box to find out where he’d be going in the afterlife. Violent J came out rapping the opening lyrics to ‘The Show Must Go On,’ followed shortly by Shaggy 2 Dope. It didn’t take long before the clowns each grabbed a 2-liter of Faygo and began spraying the swaying and jumping crowd. The entire building was suddenly hot, humid, sticky, and smelling of Faygo Root Beer as ICP performed their much beloved Third Joker’s Card and each song was greeted by a new cast of characters in cheap Halloween clown and ghoul costumes who danced along to the music, sprayed more Faygo onto the cheering crowd, or enacted specific bits for various songs, such as throwing feathers onto the crowd during ‘Chicken Huntin.’’ ICP has always been one of the most difficult music performers to shoot because of the stage show antics and liberal spraying of Faygo soda throughout the set and this day was no different. Fortunately, the Rail Club had erected a barricade to give security room to help those crushed by the crowd and catch crowd surfers, a first for this club, and it gave me room to maneuver and get in the best position to capture each moment of the show. The security was very good and incredibly friendly, and not being used to working a barricade, let me stay in the area through the entire concert. Even having my own small area in front of the stage to walk around, I had to keep my head on a swivel to keep from being hit in the head by a full Faygo 2-liter and stay out of the way of security as they reacted to the insanity of the crowd and incoming crowd surfers, which sometimes included Violent J himself jumping off the stage. While I had my camera in a watertight case, keeping the lens, the eyepiece, and my own eyes relatively dry through the show in order to photograph was a constant struggle. Eventually, ICP got to the end of the album and I retreated to a high vantage point to best capture the Faygo Armageddon during the last song as Juggalos rushed the stage to help the clowns throw the last of the Faygo. As the concert ended and Juggalos wondered around in a daze, soaking wet, sticky, and covered in feathers and confetti, some looking for lost items and others pulling cigarettes and phones out of Ziploc bags. Outside of the venue, I continued photographing everyone as they dried off, changed into dryer clothes, and prepared for the after party across the street at Tomcats West. Once over to the smaller venue, basically a bar with a stage, the line of Juggalos again snaked and winded across the parking lot and everyone socialized and met up with friends just arrived who hadn’t been able to get into the first sold out show. Once inside, the tiny building was just as packed with Juggalos and Juggalettes as the first venue, but I muscled and cajoled my way to the front of the stage to have a good vantage point in this show, a show unlike any other and which Juggalos had no idea what to expect. There were rumors that ICP wasn’t even throwing Faygo at this concert, it would be a tiny, intimate set of rare songs not often performed live. After a terrible nameless opener and a great set from much loved Dallasites Claas and Sicnoize, ICP finally hit the stage again. The crowd was just as wild even after already being through one ICP show, and this time I had to withstand the swaying and thrown arms as I attempted to photograph the clowns. The venue’s lighting was terrible and good images could only be captured when the performers stood on specific sections of the stage. Through the concert, I managed to position myself just off to the left of center from the stage right behind a short girl at the edge of the stage and managed to finally start getting quality photos of this rare performance. As ICP began to get to the end of the song ‘Pass Me By,’ they thanked everyone for coming out and urged everyone to violently rush onto the stage with them. 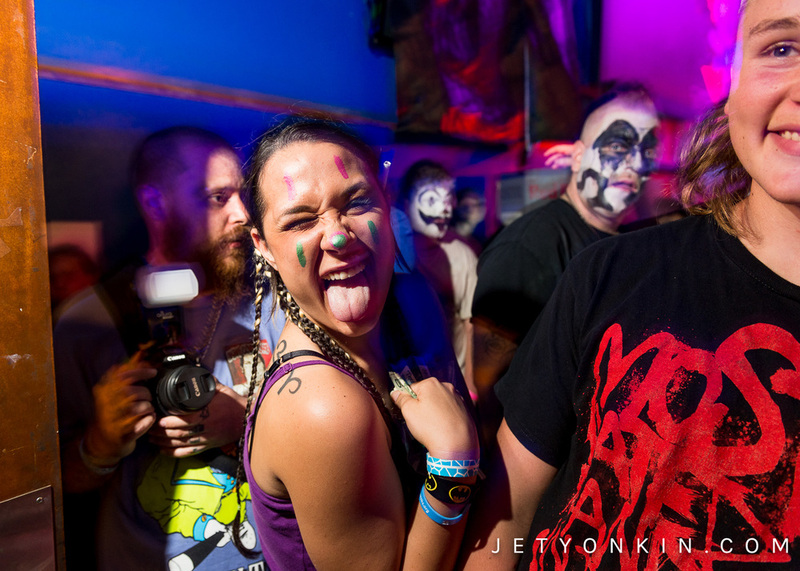 At that moment, the insanity turned into pure chaos as the entire club of Juggalos and Juggalettes attempted to get on stage before the clowns left. After everyone calmed down, everyone filtered out of the club in a daze, I snapped the last photographs of the night of everyone wondering into the night and drove home at three in the morning, feeling at once completely drained and exhausted and exalted that I had just covered one of the greatest clown events to ever go down. 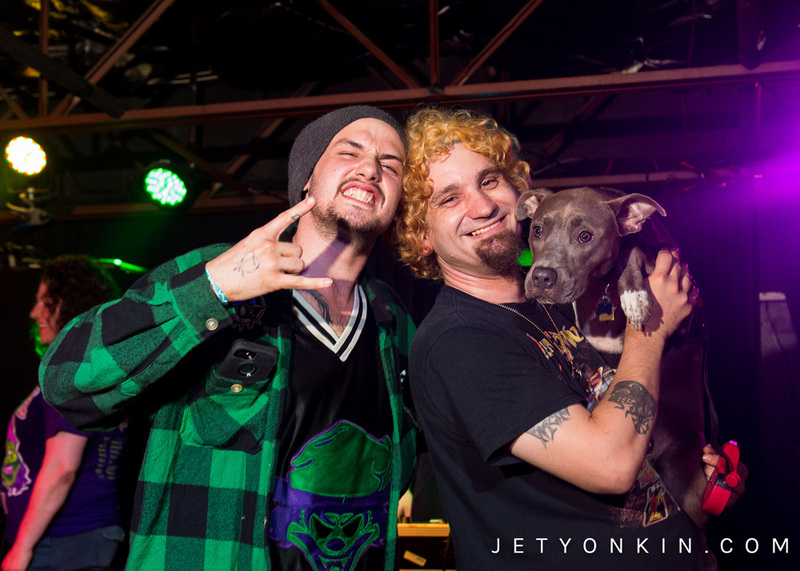 Here are just a few photos from the night and be sure to stay tuned to my Facebook page Jet Yonkin Juggalo Photography for more images coming soon!